Strengthening Families is a research-based, cost-effective strategy to increase family stability, enhance child development and reduce child abuse and neglect. Through the Strengthening Families Initiative, more than thirty states are shifting policy, funding and training to help programs build these protective factors with the children and families they serve. 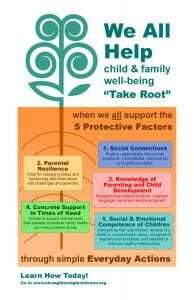 Many states are also using the Strengthening Families approach to integrate state prevention strategies, focus on families in the child welfare system and engage parents and communities. Strengthening Families™ in West Virginia began long before any dollars were ever invested; however, formal efforts with dollars attached to them began in 2007 with a three-year $25,000 Innovation Grant to the Cabell County Family Resource Network (FRN) from the WV Children’s Trust Fund. Efforts on the state level involve multiple state and community partners including the WV Children’s Trust Fund, the Bureau for Children & Families, the Bureau for Public Health and Prevent Child Abuse WV. The state’s Prevention Leadership Council is overseeing implementation efforts, which depends on collaboration among administrators of West Virginia’s Early Childhood Comprehensive Systems (ECCS) grant initiative, Community-Based Child Abuse Prevention (CBCAP) program, early care and education, Maternal, Infant and Early Childhood Home Visitation (MIECHV) grant and the statewide Early Childhood Advisory Council (ECAC). The Strengthening Families West Virginia logo was inspired by the West African, Adinkra Symbol for strength (in mind, body and soul), humility, wisdom and learning. The Adinkra Symbols are primarily used in Ghana by the Ashanti people.